Deadline for Signup is Thursday, April 18! The Spring Banquet is now open for registration. This year, we will be having the Banquet on April 27 at The Loft at the Cove in Yarmouth. Don't miss out, sign up online no later than Thursday April 18th! Please sign up here for the social event of the season! The overnight U-Drive trip to Jay Peak when well. We had three and a half days of great skiing with fresh snow and NO lift lines. All trails were open, some of our group enjoyed the glades that Jay is known for. The bump runs had good cover and softened up in the afternoon which made for great spring skiing. The welcome party provided a good opportunity for socializing, networking, telling jokes and skiing stories (lies) followed by a well done group dinner at Alice's Table. The last fly trip of the season was to the high desert of Oregon and Mount Bachelor. If you've never been here, make it a point to go! It's one of the best kept secrets around, and the mountain, town, and general fun vibe is one of a kind! Enjoy the photos from the trip below. Sugarloaf Week in the books! Wind, snow, cold, bluebird days, and incredible skiing. Sugarloaf had it all this year. Enjoy the photos below from Sugarloaf Week! Wall-to-wall powder greeted the CCSC for their week in Jackson Hole. Enjoy the photos below of the Jackson Hole, Wyoming trip! The first CCSC fly trip of 2019 is in the books! Enjoy the photos below of the Steamboat, Colorado trip. Another sold out trip is in the books! Two busses transported more than 100 CCSC members to Okemo last week. Mother Nature made the trip interesting, but everyone was rewarded with a powder day at Okemo! Enjoy the photos below of dinner at the Mansion courtesy of Pat Burnham. So Happy Together, 2018 CCSC Holiday Party! Another CCSC Holiday Party is in the books. With close to 100 people, it was one of the best attended events of the year. Thanks go out to the DoubleTree for helping us put on another successful event. From the appetizers to the pizza to the dessert, everything was first rate. We were lucky to have the Mike Dumas Band for the evening, and they pulled out all the stops. Several boxes of food donations were collected for local food pantries, the raffle was a big success, and Santa himself was in the house with his bag of gifts! 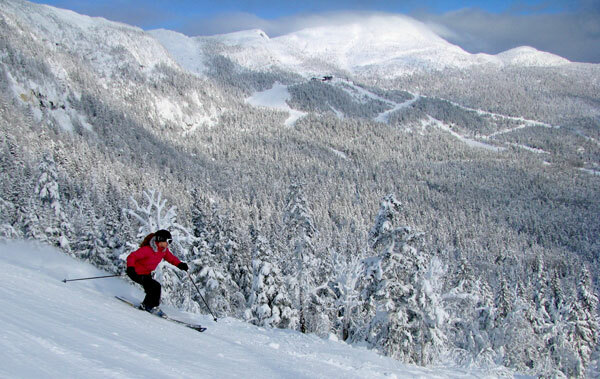 Laura Wood was the winner of the Super Raffle—one night and 2 days at Loon Mt. compliments of Rodgers Ski and Sport in Lincoln NH! Please enjoy the photos and videos below. We wish you all Happy Holidays and a Snowy New Year! 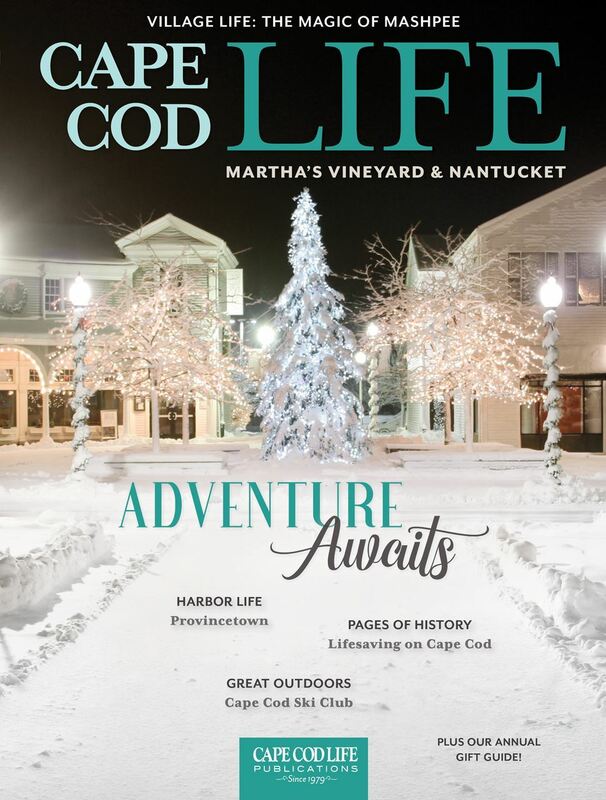 Cape Cod Ski Club: Adventure Awaits! 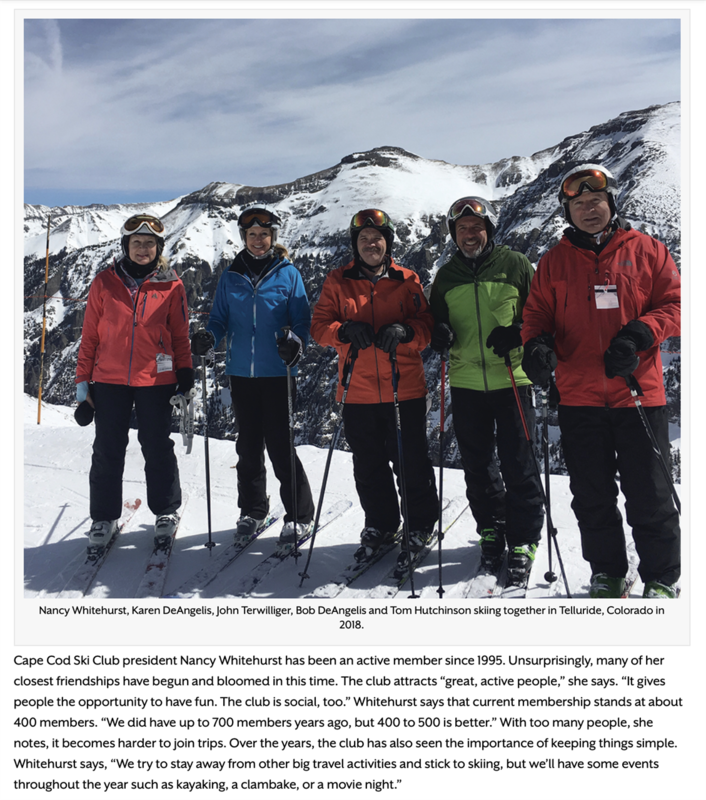 Check out the latest edition of Cape Cod Life for a multi-page article about our Cape Cod Ski Club! Many of our members are featured in photos and quotes in the article. Find it online or at your nearest newsstand. Help spread the word about our club! Download a flyer (Ambassador flyer1.pdf, Ambassador flyer2.pdf) and consider posting it where people will see it: the gym, coffee shop, grocery store bulletin board, or your workplace. Let's let people know about the best ski club in the Northeast! Time to Renew Your CCSC Membership! Renew your membership so you will be sure to receive email updates about next year's trips! Remember, only members may sign up for fly trips and overnight trips. The fly trips will be open for registration before you know it! Remember, Membership dues go up to $50 on October 1st. Sign up now and save! New styles, new designs, new fabrics are all part of the new 2018 Cape Cod Ski Club clothing now available! See the latest styles at the Holiday Party. Please contact Jeff Vivian at 508-776-6835 or bartlax47@gmail.com for more information or to place an order. who gave a fitness presentation at the October 16th general meeting. Steve, along with several member volunteers, presented a complete workout-for-skiing. Steve has made his complete presentation available for CCSC members. Are you planning a Fly Trip this year? In a classic Vail move, the company announced the addition of Stowe Mountain, one of New England’s premier destinations for skiing and riding, to the Epic roll call – one that now contains an unprecedented ten resorts in North America and one resort, Perisher, in Australia. The $50 million acquisition also finally puts Vail on the map in the densely populated East Coast, which should prove to be hugely successful for the company. Vail has a track record of success with its acquisitions and this doesn’t appear to be so different. So what will be different at Stowe? Approximately nothing, but you might save some money. The numbers haven’t come out yet and technically the acquisition won’t take place until later this spring, but since last year’s full EpicPass was right around $800, you’re going to save about, oh, $1000 on your pass to Stowe. Yes, a season pass just to Stowe if you bought it before November 6th cost $1860. Holy mother of God. For $800-ish you can ski ten resorts in North America? Someone please tell me why every American doesn’t ski. (excerpt from Greg Colquitt, Ski Industry News.Feb 22, 2017)..
Monday, January 7, 2019 at 6:00 p.m.
287 Iyannough Road, Hyannis, Massachusetts, 02601. Please contact a Board member if you plan to attend. from September thru March at 7:00 p.m.